Things didn’t work out for installation experts Ball-Nogues Studio at MOCA’s New Sculpturalism show, but the firm has rebounded nicely. They’ve just completed mounting one of their most ambitious works yet: a 70-foot-tall upside-down replica of William Pereira’s Transamerica Pyramid, for the show Modernist Maverick: The Architecture of William Pereira, on view at the Nevada Art Museum in Reno, NV. 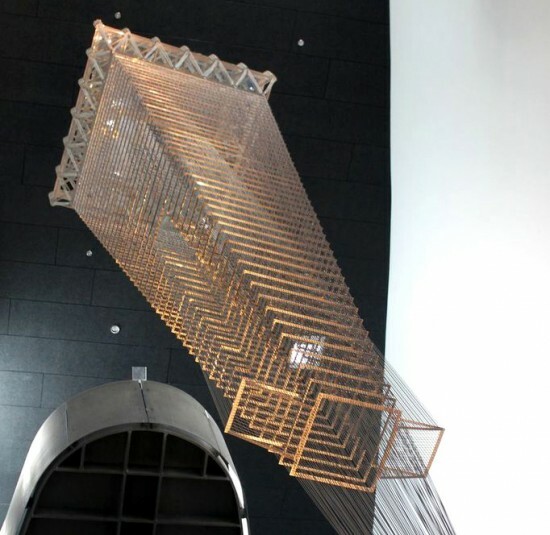 The installation, made out of chain link and stainless steel plates, hangs from the ceiling via steel cables attached to the museum building’s structure. “We distilled it to its barest essentials. It looks like the ghost of the building,” said Ball-Nogues principal Gaston Nogues. Each chain could only be attached at a specific point, so the hardest part was fine tuning the model, stretching and moving each possible iteration, added Nogues. “It’s quite labor intensive to make sure it looked flat, and that each chain had the right tension,” he said. The show, which opens next week, runs from through October 13. It looks at many other noted Pereira projects, including the Los Angeles County Museum of Art; the University of California, San Diego Geisel Library, and the Theme Building at LAX.